Plenty of people shudder at the mere mention of cockroaches. Imagine how freaked out they’d be if they caught a glimpse of these 10 biggest insects in the world! While there are several ways to measure a creature’s size (mass, length, wingspan, etc. ), this list goes by visual impact, and arranges the insects according to length. By the time you’re done reading, you’ll be well on your way to becoming an amateur entomologist! The measurements are close between several members of the beetle family, so we’re in for a tight competition. The lengths that other kinds of insects can grow to might surprise you as well. Let’s learn about ten of the world’s biggest insects and see how they compare with one another. This gentle, beautiful giant boasts a wingspan of around a foot, and commonly drifts over the Malay archipelago. Its bright colors make it a wonder to behold, and the tips of its wings mimic the look of snakes’ heads in order to deter predators. 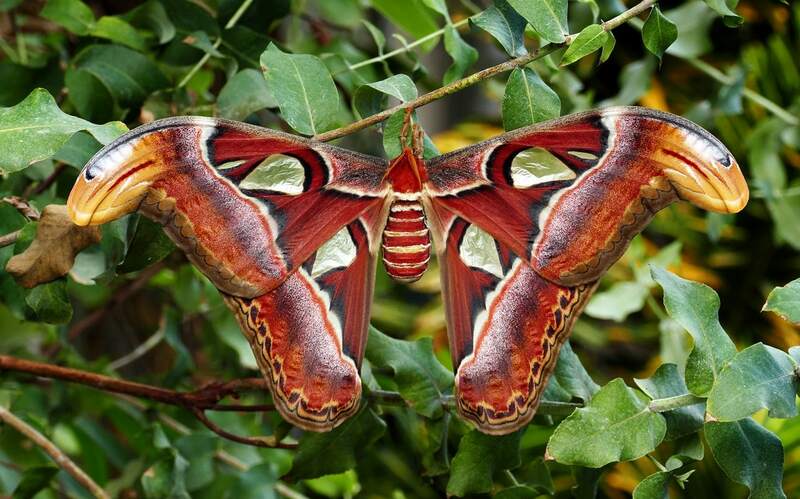 Even if the striking Atlas Moth avoids being eaten, its life span remains short due to its lack of a mouth. It has no functioning proboscis, meaning that it loses vitality and fades after one to two weeks of life. Most of its brief lifespan is spent waiting and searching for an appropriate mate. The Atlas Moths’ cocoons are spun from durable silk fibers, leading people to cultivate the beautiful moths for their silk. The silken fibers are then used to craft items like fabric and purses. The Atlas Moths’ cocoons are even used in China as skin care products. These strange insects inhabit watery areas worldwide, and survive without the use of lungs or gills. Instead, the bugs use a respiratory siphon like a snorkel and keep backup air pockets trapped beneath their wings. 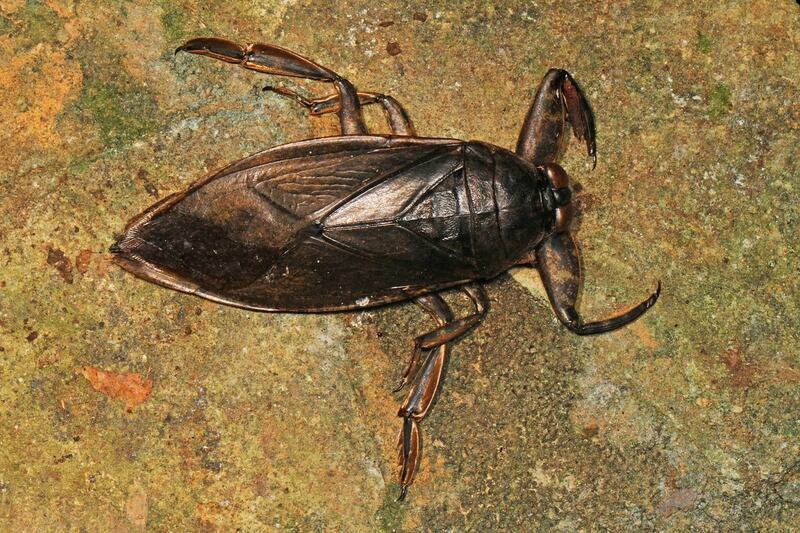 The Giant Water Bug’s intimidating set of pincers empower it to feast upon small frogs, fish, snakes, and sometimes even baby turtles. This water-dwelling menace of the insect world can inflict painful bites, which has earned it the nicknames “toe-biter” and “alligator tick”. These tables are often turned when the people of Thailand attract the local variety of these hefty insects with blacklights and capture them for eating. It’s hard to determine whether his impressive beetle gets its name from its size, or from the large, forked horn on its head that resembles tusks. Either way, both size and horns are put to work during mating season while male Elephant Beetles compete for female attention. Besides combat, the horns also serve to dig safe spots in the sand and pry up bark so that the beetles can feed on sap. The larvae of the Elephant Beetle take around two to three years to mature. The larvae gorge themselves on organic matter and can weigh up to 86 grams. The Atlas Beetle takes intimidation to a whole new level with three prominent horns that extend from its head. Its ambition begins in its youth, when Atlas Beetle larvae have been reported to fight one another for food. 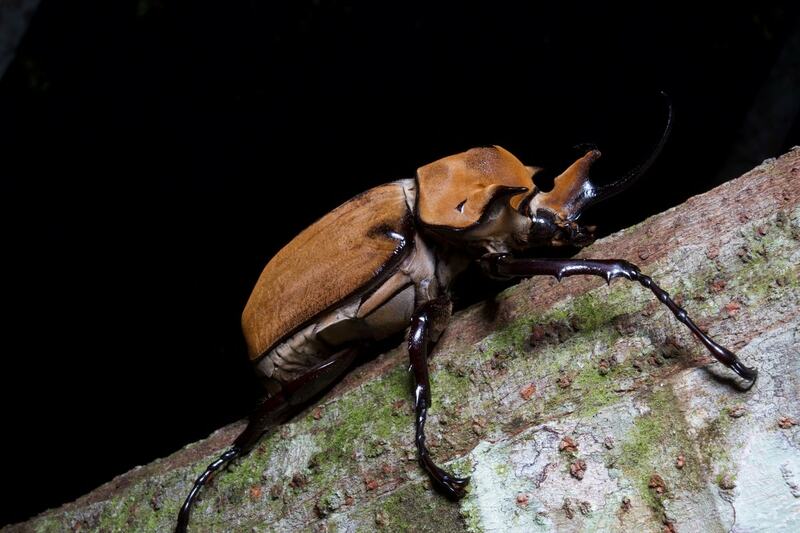 These hulking beetles are also reported to be able to lift 850 times their own weight. That makes them one of the strongest animals in the world for their size. While the Atlas Beetle can lift an impressive weight with its horns, its wings aren’t so strong. They have trouble supporting their own weight while airborne, meaning that they can’t fly very far. For this reason, their population is mainly restricted to Malaysia. As if it weren’t big enough as an adult, the Actaeon Beetle also boasts one of the largest larval stages. The massive larvae can weigh up to 200 grams, though they generally hide beneath the soil where they hatched from their eggs to mature unseen. The Actaeon Beetle’s larval stage together with its pupation stage totals a developmental period of nearly three years. Like most horned beetles, Actaeon Beetles use their formidable horns during combat with one another. Their fighting style is reported to closely resemble that of deer, as they crash together in attempts to use their horns to unbalance their opponent. This impressive heavyweight is often given the title of largest insect in the world when taking mass into account. Despite being measured at a shorter overall length than the Hercules Beetle, the Titan Beetle has one of the greatest lengths in terms of body measurement alone. The impressive horn extends from its thorax to make up a significant portion of its length. The female Titan Beetles often keep to themselves in the trees, and males are sighted more frequently as they search for mates. The male Titan Beetle warns his foes with a loud hissing sound before clamping down with a strong pair of pincers in self-defense or aggression. 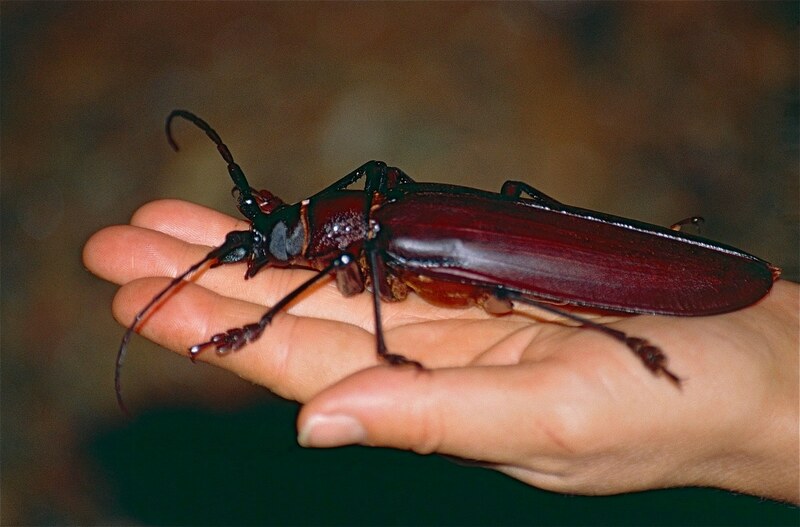 The larvae of the Titan Beetles are noticeably larger than the adults. Once these massive grubs reach maturity and take flight as adults to find their mates, they no longer eat. 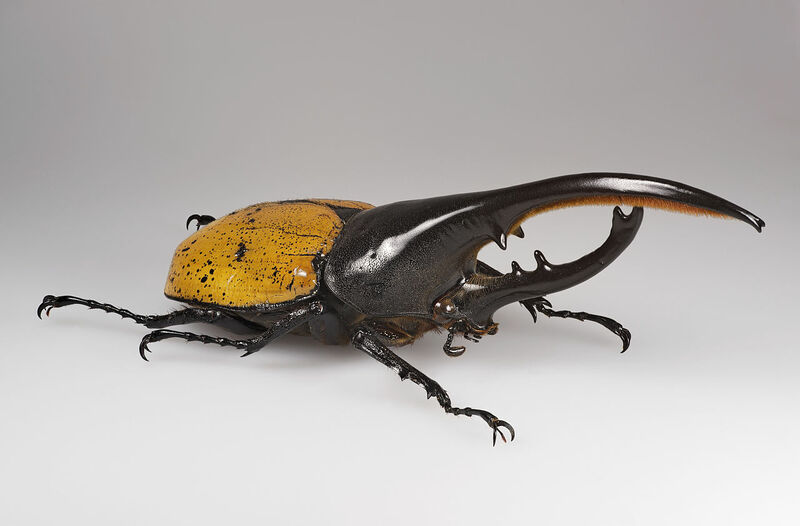 When you take the length of its impressive horns into account, the male Hercules Beetle slightly surpasses the Titan Beetle in length–although, it’s a close competition. The glossy, black horn makes up around half of the Hercules Beetle’s length and gives it a formidable appearance. This impressive beetle competes against the Atlas Beetle for the strongest insect in the world, and is also capable of lifting 850 times its own body weight. This extraordinary strength may be where the Hercules Beetle got its name. 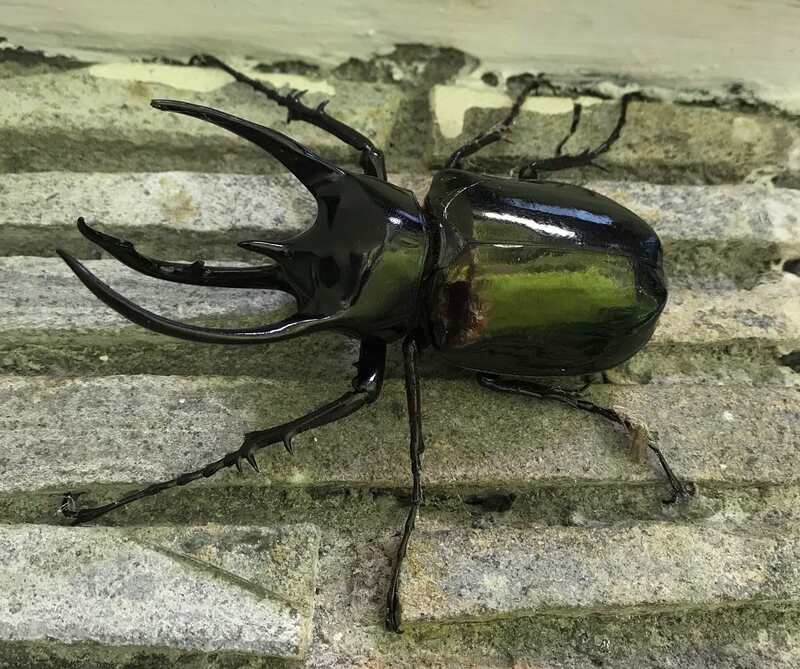 Like many other beetles, the Hercules Beetle is nocturnal, coming out of hiding during the night to consume a varied diet of fruit, rotting wood, and smaller insects. Macrodontia means “long tooth”, while cervicornis means “deer antler,” and it’s easy to see why the Sabretooth Longhorn Beetle got its name. The curved, serrated mandibles extending from the beetle’s head certainly resemble deer antlers, and do an excellent job as weapons and tools. The beautiful wood-like pattern on the beetle’s back serve to camouflage it on the rainforest floor and among the rotting wood that it devours for nourishment. Unlike other massive beetles, the Sabertooth Longhorn Beetle is not rendered flightless by its impressive weight. This powerful beetle’s intricately patterned wing cases hinge forward to allow enough wing movement to effectively take flight. Don’t let the delicate weight of this graceful insect fool you–larger specimens of Praying Mantis have been known to hunt and eat birds. Praying Mantises hunt by waiting patiently for prey to come within reach, and then striking with their folded, powerful front legs. The large, clawed legs make these insects look as if they are praying, and are what gave the Praying Mantises their name. These lurking hunters have five eyes that help them hunt effectively. The two large compound eyes on the sides of their heads are the most noticeable, but they also have three smaller, simple eyes on the middle of their heads. 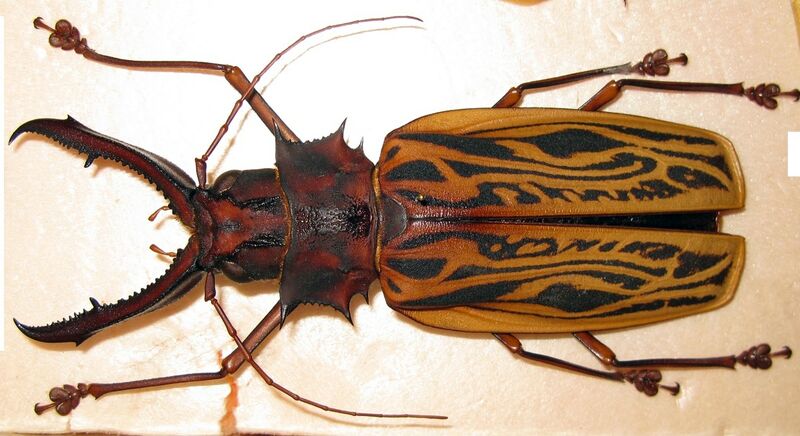 Phryganistria chinensis Zhao is the biggest insect in the world. 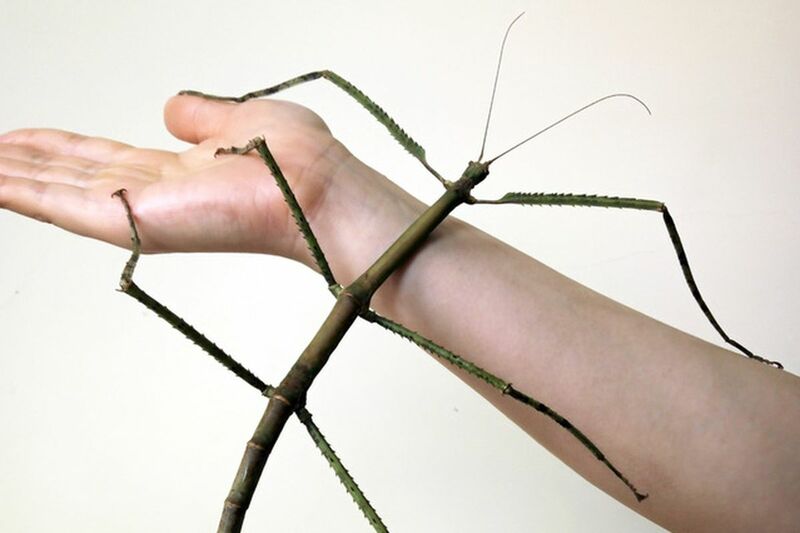 This giant stick insect was officially recognized as being the longest insect in the world in 2016. Discovered in the forests of the Guangxi province by entomologist Zhao Li and named in his honor, this jaw-dropping insect is as long as the average man’s arm. Zhao Li has since bred this remarkable specimen in the Insect Museum of West China. The impressive Phryganistria chinensis Zhao has an appetite for sweets. While the amount and frequency are highly restricted because of uncertainty over how it might impact the insect’s health, strawberry jam is this giant bug’s treat of choice. The insect’s sweet tooth is so intense, that it’s been observed rejecting other food in favor of the jam.